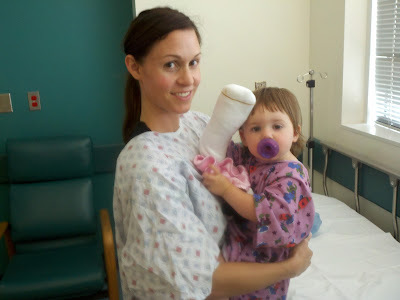 Last Wednesday was Madelyn's surgery for her finger. We knew they would be taking the tip of the finger off that didn't reattach successfully, then cleaning the finger. After that, we, and they, didn't know what route they would take to fixing it. It all depended on how much good tissue was remaining, how much bone was sticking out and a bunch of other factors that aren't really fun to think about. As I mentioned in the last post, Madelyn wasn't allowed to eat or drink anything the morning of the surgery. Usually, she wakes up, chugs a glass of soy milk, eats some breakfast, chugs another glass of milk or water then eats breakfast with Patrick when he gets up. Even then, she'd probably eat more if she didn't want to get down and play so much. Amazingly though, she did awesome the morning of the surgery. We let her have her pacifier a lot that morning so she'd have something in her mouth to occupy her and that seemed to do the trick. 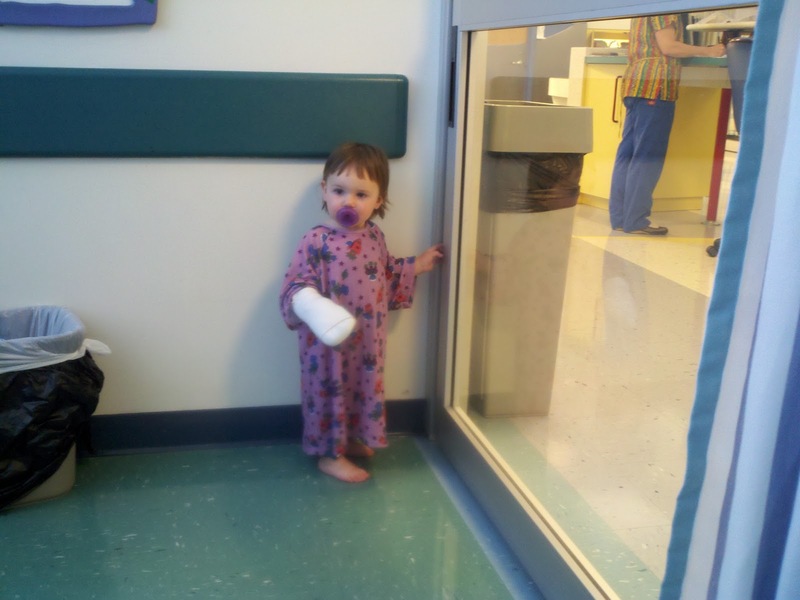 She was in a great mood and was mostly just curious about all the new toys and people in the surgery center. And here is Madelyn in her hospital gown. One of the saddest and cutest things I've ever seen. She was so sweet walking around the waiting area trying to play with all the other kids with her little diaper hanging out of her gown. Angie and I then waited for a solid 5 1/2 weeks for surgery to be over. Ok, it was actually about 1 1/2 hours but it felt like forever. Luckily, Grandpa came to see us and it was the perfect distraction. My Dad has a calming presence about him and when he's around I just generally feel better about whatever is happening. Madelyn apparently feels the same way because after surgery she couldn't get enough Grandpa hugs. At 1 PM, they rolled our little girl into our room on what looked like the longest bed ever. They warned us that she would be very out of it, lethargic and probably wouldn't move around much for the first 20-30 minutes but we shouldn't worry. We immediately went to her side and as soon as she saw us she stood up in the bed, IVs and everything to come hug us! After going back and forth between Angie and I for hugs, she then fell asleep on Angie and took a nice nap. Our surgeon came in and told us the surgery went very well. They were able to do the less involved of the two possible repairs (the V-Y Flap rather than the Crossed Finger Flap) which was great news. It means a faster recovery, better long term results in terms of sensation in the finger, durability and appearance and only one finger to heal rather than two. 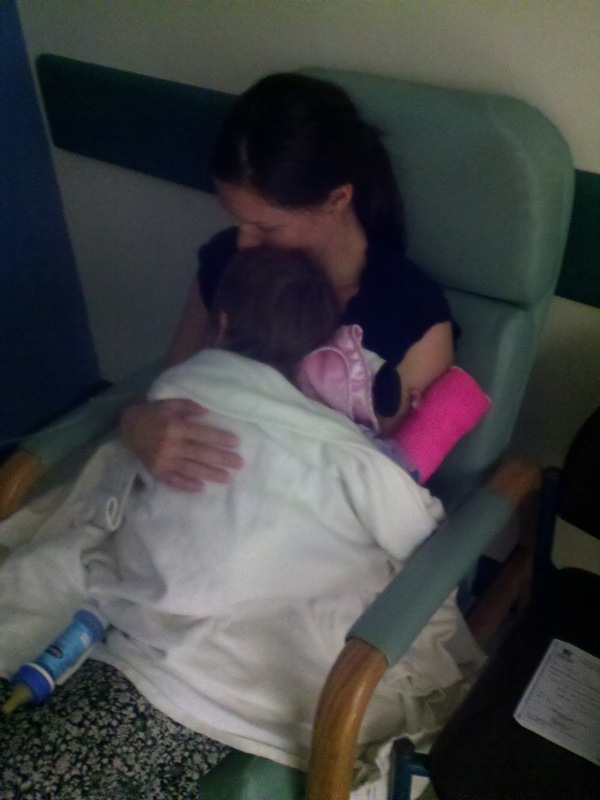 We hung out at the hospital for a while letting Maddy finish her nap and then made sure she could keep food and water down. Thank you again to everybody for all the prayers and kind words. Thank you mostly to my amazing family that I sometimes forget how blessed I am to be in. Each one of them is better than I am in so many ways. Madelyn handled this whole thing, from the injury to the repairs, more courageously than I would now and she's only 15 months. Patrick has been amazing in his ability to roll with the punches and schedule changes and has been completely selfless as we've had to give Madelyn extra care and attention. And of course Angie has met this whole thing with the same quiet force she meets every challenge with. I am always amazed and impressed watching her be a Mother. She is fearless and patient and endlessly compassionate and I'm eternally grateful I get to go through all of this with her. 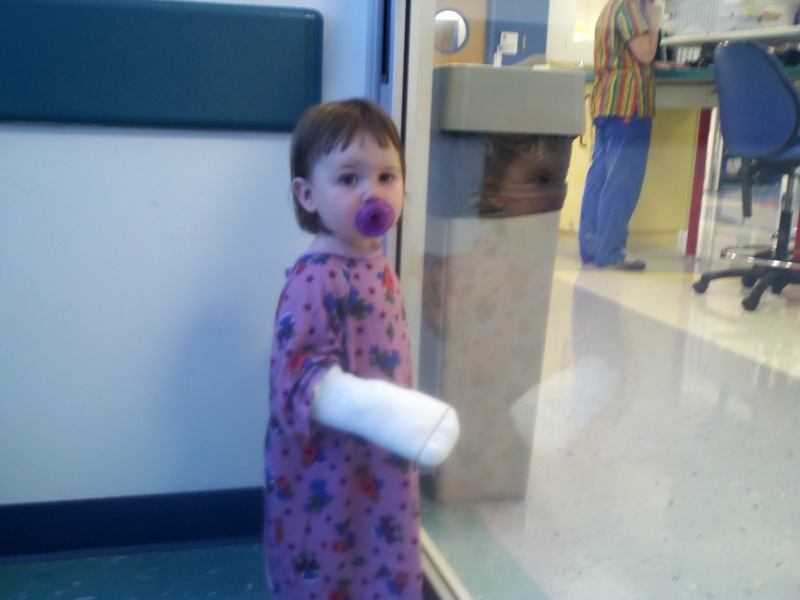 Madelyn had her follow-up appointment today and the finger seems to be healing very nicely. She got a new green cast this time. The plan is to go back next Tuesday and hopefully get the cast off for good! So glad to hear that they were able to do the better of the two options. Toby, I enjoy how you are able to express yourself - love the second last paragraph. You do love Angie so very much. 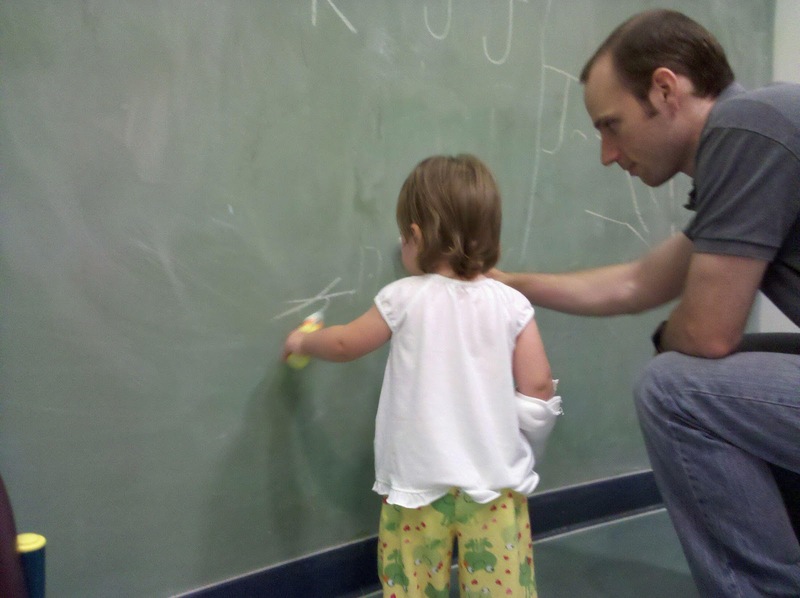 You have an amazing, strong girl there - if she is like this at 15 months old, what will she be like at 15 years old?!?!? Sending love and kisses to all!! Maddy your new name is Super girl! My heart broke and then healed again about 14 times during this post. By the end, all I wanted to do was hold that baby girl! The four of you are doing an awesome job getting through this. Looking forward to the end!